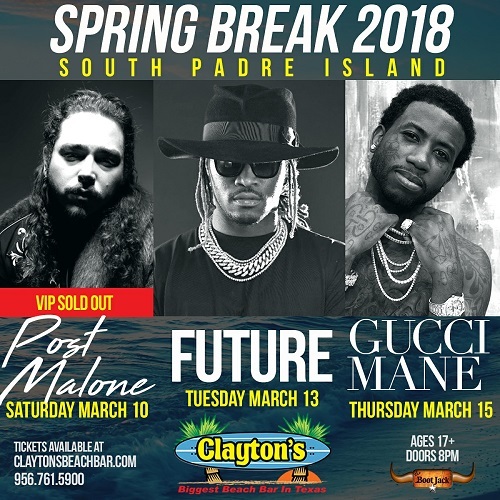 For the past few years, Claytons Beach Bar has been bringing some of the biggest talent to South Padre Island, Texas for Spring Break. Last year over 20,000 beach goers saw concerts from their favorite artists, such as Migos, Lil Wayne, 21 Savage, Lil Yatchy, Rae Sremmurd, Playboi Carti, Russ, & More! This years line up continues the tradition in a big way, with over 25,000+ attendees are expected to attend. March 10th, 13th, 15th you can catch Future, Post Malone, & Gucci Mane Live in concert. Tickets are selling out fast, so get them now. Make your plans, Texas will be on a level.